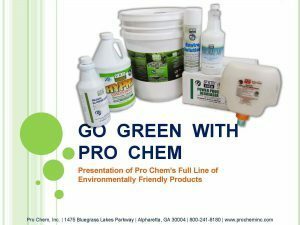 ENVIRO SOLUTION | Pro Chem, Inc.
ENVIRO SOLUTION uses a revolutionary technology that remediates hydrocarbons into water and carbon dioxide eliminating 100% of disposal cost. It does not redeposit oil, grease and grime on other surfaces like most degreasers. Instead, it restores oily, slippery floors with a deep cleaning by dissolving embedded oil, grease and grime. You can use it to clean scrubber brushes, pads, squeegees and internal hoses and tanks allowing the scrubber to leave a cleaner surface. It extends the life of mop heads by up to 33%. ENVIRO SOLUTION reduces spill cleanup time and disposal costs. It dries quickly leaving surfaces non-slippery during and after application. Can be applied in wet or windy conditions. 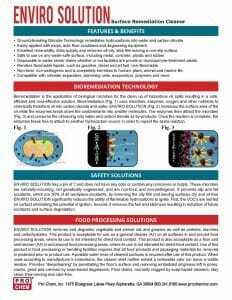 This product is compatible with skimming, evaporators, biological and polymer treatment systems. The preferred method of disposal is in an oil/water separator, pretreatment and/or wastewater treatment facilities. It reduces the frequency of pumping by dissolving sludge buildup and emulsified oils. Mopping: For best results with oily floors or visible oil, allow the solution to remain on the surface for about 30 seconds before mopping. Liberally apply to floor with a wet mop and agitate solution into surface. Auto Floor Scrubber: For best results, employ the double-scrub method. For the first pass, do not lower squeegee. Spray solution while scrubbing. For the second pass, spray solution, scrub and lower squeegee for soiled water removal. Degreasing: The dilution rate may be determined if the operator will be using rags to clean (stronger), scrub brush (medium) or rinsing with a power washer (weaker). 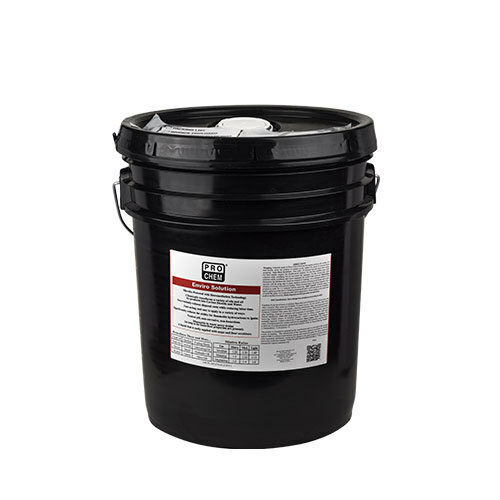 When cleaning heavy oil/grease deposits, allow product to soak for 1-2 minutes before removing. Ratio depends on soil type and concentration. Fuel Remediation: Use 2 gallons per 1000-gallon tank, circulate throughout the tank to render the fuel nonflammable and neutralize any flammable vapors. Rinse tank with pressurized water, leaving a clean, residue-free and vapor-free environment. Golf Course De-oiling: Dilute 10:1 with water. Spray on infected area and let stand (1-2 hours), repeat three times then put on regular seeding and nutrient schedule. Product is activated by water. It will not work undiluted. The figure shown on the left shows a 1000 gallon underground fuel storage tank containing jet fuel residue and flammable vapors. Before this tank could be dismantled with cutting torches, the remaining fuel needed to be neutralized and the tank thoroughly cleaned to remove any flammable vapors. Two gallons of Enviro Solution were applied and circulated throughout the tank. The picture on the right shows that the remaining jet fuel was remediated, rendering the fuel non-flammable and neutralizing any flammable vapors. The tank was rinsed with pressurized water, leaving a clean, residue-free and vapor-free environment.